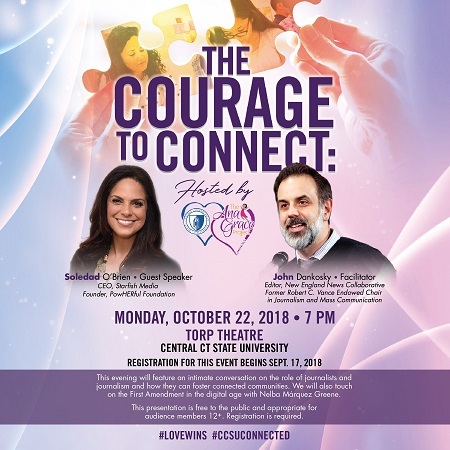 The CCSU/Ana Grace Project "The Courage to Connect"
1. A group of us want to come! Can I register more than one person? We are so excited a group of you want to come! Groups of 8 or more can register by sending a note of inquiry to: info@anagraceproject.org. Please leave a detailed message with contact information. Groups of 8 or less can purchase tickets at tickets.ccsu.edu or at the CENtix Box Office, located at CCSU's Student Center Information Desk, 1615 Stanley Street, New Britain, CT 06515. 2. Will limited mobility parking be available? As with all events at CCSU, parking for those with limited mobility will be available. Please have all necessary permits visible for our officers. 3. I am attending this event and I am a member of the deaf community. Will there be an interpreter? We are thankful that you are coming and we will have an interpreter available. 4. Is there assigned seating? This is an open seating venue. It is best to arrive early if you would like a certain spot. 5. I live far away. Can I watch this event on line? This event will not be live streamed. 6. I have questions not listed here! Is there a contact for the event? 7. I need a ticket to enter the event? Yes, please bring your ticket, or the Print @ Home ticket, or the Print @ Home ticket on your mobile device. 8. Where do I park? Will I need a parking pass? Park in the Welte Garage (no passes needed) and walk southwest to Davidson Hall. Torp Theatre will be on the 1st floor and signs will be posted on campus to direct you to the event. 9. Where can I find a CCSU Campus Map? 10. What time will the doors open for the event? For ticketing questions, please contact the CENtix Box Office at (860) 832-1989. However, tickets still can be purchased online at tickets.ccsu.edu.